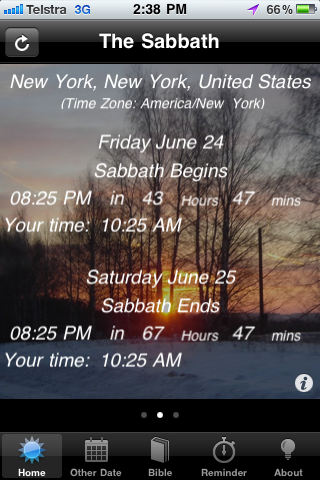 The Sabbath App will calculate the Sabbath sunset times for Friday evening and Saturday evening each week telling you exactly when Sabbath begins and ends at your current geographic location. It also allows you to choose a specific date in the future or past so you know when Sabbath begins and ends on this date. You can also add multiple locations to this app so you know Sabbath times at your location as well as other locations. You can be reminded before Sabbath begins and ends by a reminder popup. Finally read Bible verses on the topic of the Sabbath from the Word of God. This app is for SDA’s/Seventh-day Adventists, Jews and other Sabbath keepers.